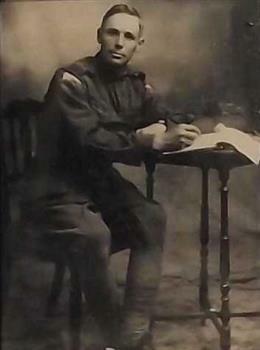 Soldier sitting at a table writing. 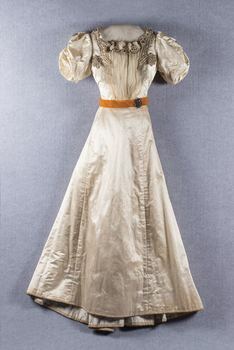 This item is part of the Dodgson Collection, which was bequeathed to Queen's College in 1892 by the Rev. James Dodgson. The collection was created by Aquila Dodgson, brother of James. Aquila Dodgson was a friend of the English Egyptologist Flinders Petrie, and it was through this friendship the Aquila was able to acquire ancient Egyptian artefacts. A detailed study of the collection was made by Christine Elias "Discovering Egypt: Egyptian Antiquities at the University of Melbourne", M.A. thesis 2010. Four piece lady's white ceramic dressing table set. Comprising of a small rectangular tray, and three small lidded-pots - one pot has a knob. 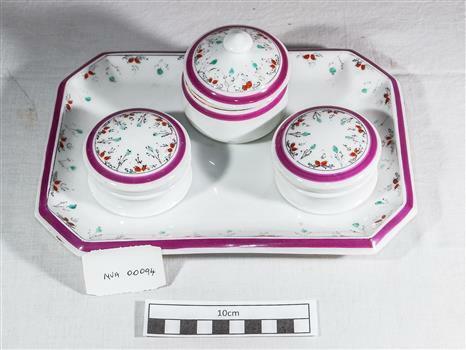 There is a hand-painted dainty red and green floral garland decoration on each of the pots as well as the tray. Remnants of gold painted decoration can also be seen. Navy blue flag with green and blue logo with white writing. Synthetic fabric with heavier white binding. 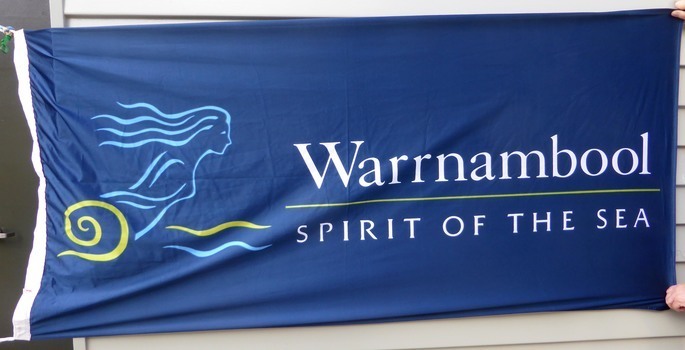 This is an item which was used around 2000 to advertise the City of Warrnambool. A statement and logo which was highly visible. This is a brown leather-covered book of 822 pages. 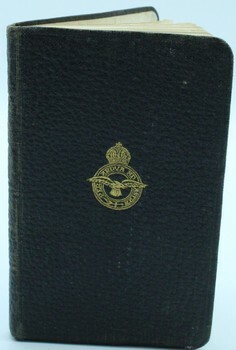 The cover extends over the edges of the pages and has gold lettering on the front cover and spine. The pages are gilt-edged and there are several colour maps at the end of the book. There is a blue ribbon marker encased in the binding. The inscription is on a loose card and is handwritten in black ink. This Bible was given in March 1916 to Private Henry Havelock Rogers (1895-1917), the son of Joseph and Ellen Rogers of Warrnambool. He left Australia in April 1916 as a member of the 14th Battalion (17 Reinforcement Group) and died in France in April 1917 as a result of wounds. The cousins named on the card were the three older children of Arthur and Agnes Rogers, also of Warrnambool. Joseph and Arthur Rogers were brothers. 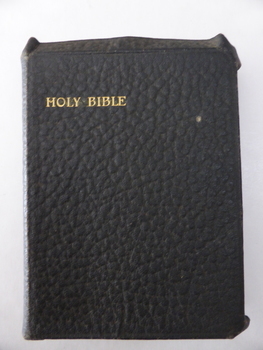 The Bible was found in the MacDonald Street, South Warrnambool home of Bill Rogers, another son of Arthur and Agnes Rogers not born until the 1920s (deceased estate item). 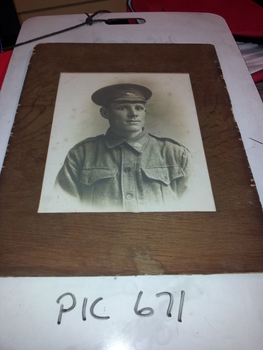 This item has a particular poignancy as it was given to a Warrnambool World War One soldier who was killed in action. Perhaps he carried the Bible with him and it was returned to his family after his death. ‘To Dear Harry Wishing Him God Speed & Safe Return From His Loving Uncle, Aunt And Cousins, Rita, Alfie & Charlie’. 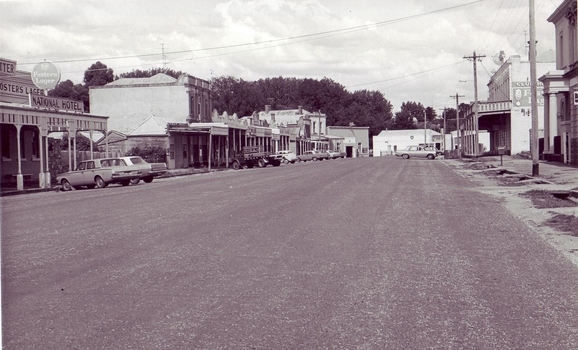 BLACK AND WHITE PHOTOGRAPH OF FRASER STREET, CLUNES. BUILDINGS INCL. NATIONAL HOTEL, CLUB HOTEL ETC. 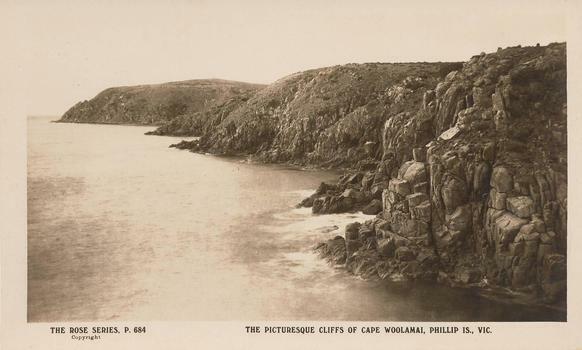 Black & White Postcard of Cape Woolamai cliffs on right of photo with sea on the left. "The Rose Series, P. 684." "The picturesque cliffs of Cape Woolamai, Phillip Is., Vic." 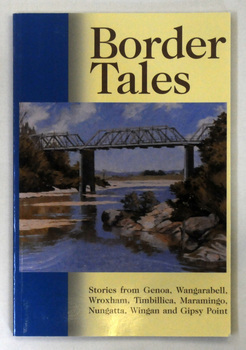 A paperback book of 120pp titled Border tales : stories from Genoa, Wangarabell, Wroxham, Timbillica, Maramingo, Nungatta, Wingan and Gipsy Point. On the front cover is a coloured picture of the bridge across the Genoa river at Genoa. The book was compiled by Peter Allard and Geoff Alves and published by the Genoa Town Committee. 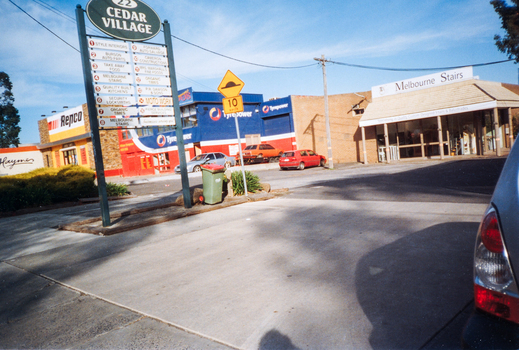 Genoa is a small town in East Gippsland, Victoria. 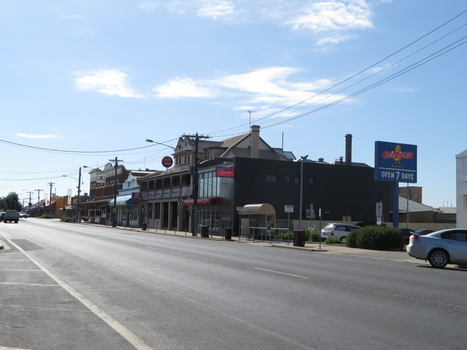 It is close to the New South Wales border where the Princes Highway crosses the Genoa River. 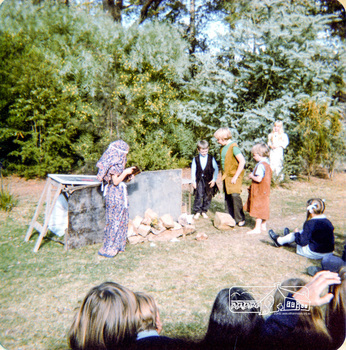 Easter play - At the Tomb; Karen Whalley, Peter Davison, Matthew Dance, Christopher Field, Fiona Berry, about April 1982 From a series of photographs (some cropped) from a magnetic photo album relating to the staff, students and activities of the Eltham Christian School which operated as part of the Eltham Christian Church at Nyora Road, Eltham. See also entries for each photograph. 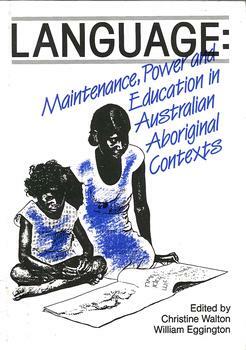 Conference themes of language and power, language maintenance and language in education raised in an Aboriginal context; papers separately annotated. 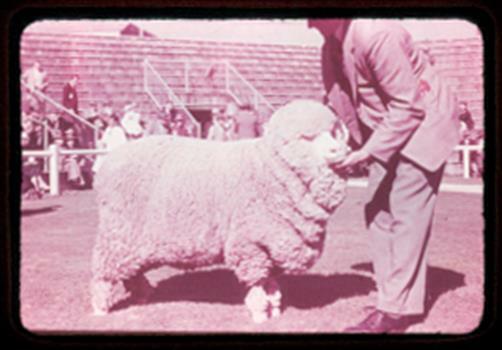 Slide of a fine Merino ewe. Slide of a fine Merino ewe. Fine merinos produce slightly longer and stronger wool than the super fine, but are found in the same higher rainfall areas ie. Western District of Victoria, the midlands district of Tasmania, New England and Yass districts of NSW. Formerly stored in presentation folder as part of "Merino & Australasian Breeds of Sheep Set No. 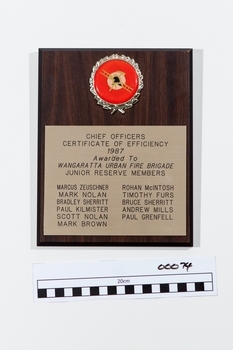 A866" series by the Audio Visual Education Centre, Education Department of Victoria. 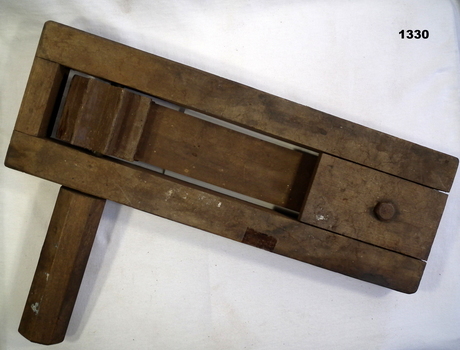 Wooden rattle with handle and metal studs. When spun, a noise is made. 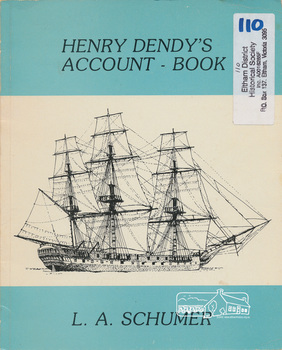 Book - Henry Dendy's account book /​ [introduction and editorial commentary by Leslie A. Schumer]. Paperback; 63 p. : facsims., geneal. table, maps ; 25 cm. Downloaded copy of article. Text and b&w photo. 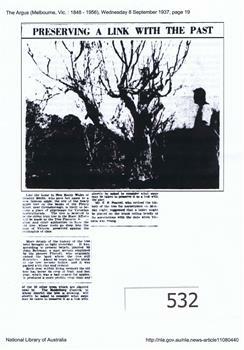 1937 article describing the Apple Tree on Plenty River at Greensborough, its possible origins and steps to preserve it. Early attempts to preserve the Batman Apple Tree and alternative explanations of its origins. Feeding cup for an adult made out of white china, now discoloured. The cup has a curved spout with a handle. This type of cup would be in use from the early 1900s to the 1930s. The cups were used both in the home and in hospitals. Photograph - Old East Ringwood Station booking office - 1975. 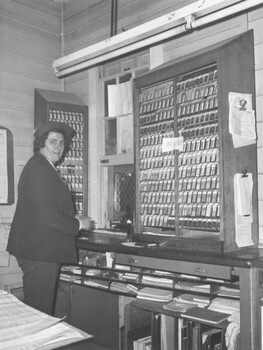 Written on backing sheet, "Old East Ringwood Station booking office - 1975". 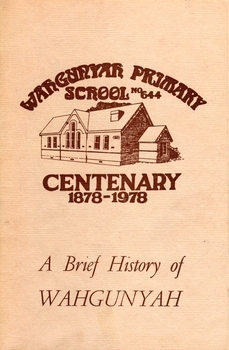 36 page booklet with beige cover and brown lettering, with a sketch of Wahgunyah School. This pin was created by Miss Annie Emily Gardner to raise relief money to support industrial unrest in Newcastle. 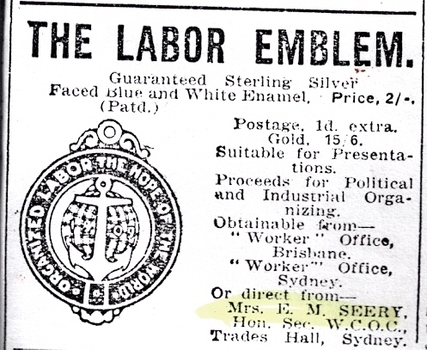 It was reported in the Newcastle Morning Herald that Miss Gardner was vice-president of the Women's Organising Committee of the Political Labour League. A copy of an advertisement for the pin has been uploaded here. Price of the silver pin was 2/- and gold 15/6. Photograph of the pin - to come. Donated to Ballarat Trades Hall by John Mildren. Significant to industrial action, union organising and the labour movement in Australia. Silver anchor superimposed over a white globe (with silver latitude and longitude lines). A safety pin is welded to the back. Blue outer circle with inscription: "Organized labor the hope of the world 1909". Inscription on the back: "USA ???" in very tiny font. Oral History - William Arthur Cecil by Bill Cecil. 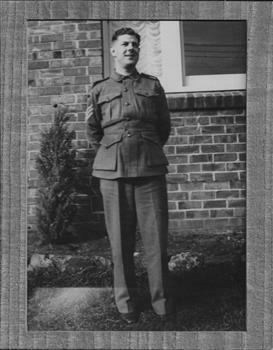 Bill Cecil moved to Greensborough in 1944 aged 14. 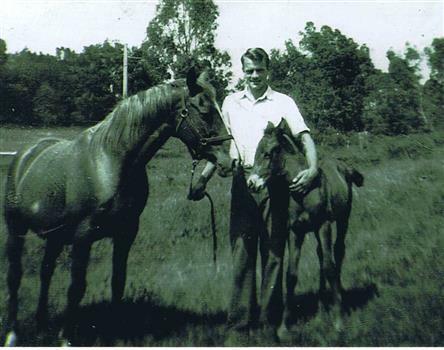 His family ran the post office and Bill became acquainted with most Greensborough families as he delivered the mail on horseback. Bill recounts his life both in Greensborough and other parts of the country. 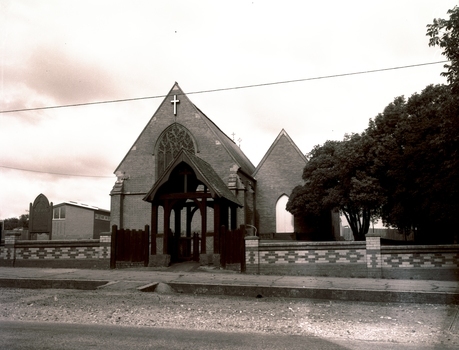 A primary source recollection of Greensborough in the mid to late 20th century. 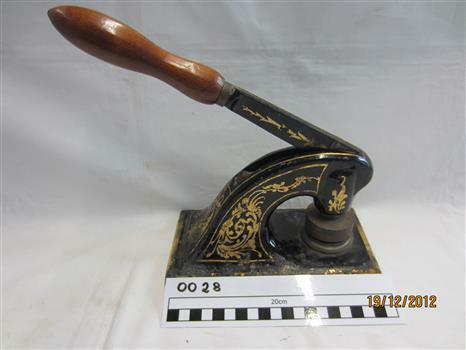 Small metal machine painted black , decorated gold . Dies are attached with the seal of Mortlake Waterworks Trust . Paper is placed between the dies, the handle depressed and the seal embossed on the paper under pressure as a blind (inkless) embossing. The seal consists of two circles with the wording "Mortlake Waterworks Trust 1915". Mortlake Waterworks Trust – 18 May 1915 to 1 July 1984 Mortlake Waterworks Trust was constituted on 18 May 1915 following application by the Shire of Mortlake to carry out works for the supply of water to the township of Mortlake. The Trust was abolished on 1 July 1984 under the Water and Sewerage Authorities (Restructuring) Act 1983 when authority was transferred to the Mortlake Water Board. 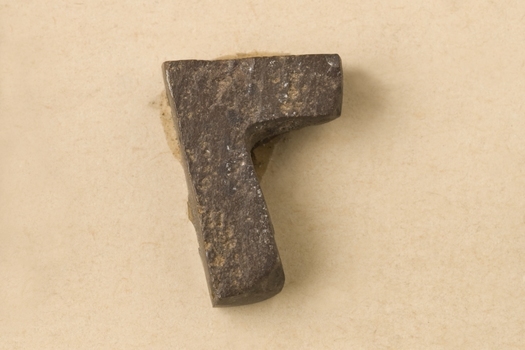 A cast iron seal press. 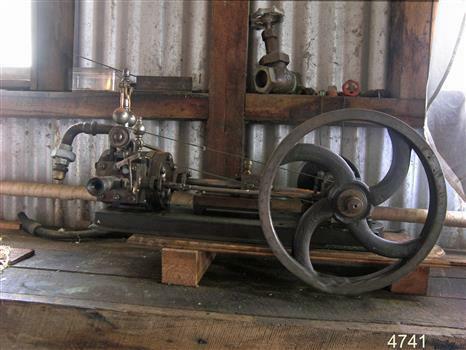 This was used by Mortlake Waterworks Trust to emboss agreements and official documents. Die is still attached to the press. It reads: Mortlake Waterworks Trust 1915. Black cover with RAF ensigna on front in gold. Issued to No 101109 F/O A.E.Pearl RAF. Photograph - Digital Image - Mrs Greenwood with two apples; and, older Gladys Greenwood: group of photographs. Digital copy of one black and white photograph and one colour photograph. A young Mrs Greenwood is seen posing with two apples; an older Miss Gladys Greenwood (daughter of Mrs Greenwood) is seen at a celebration. The Greenwood family share farmed with the Bosch family. 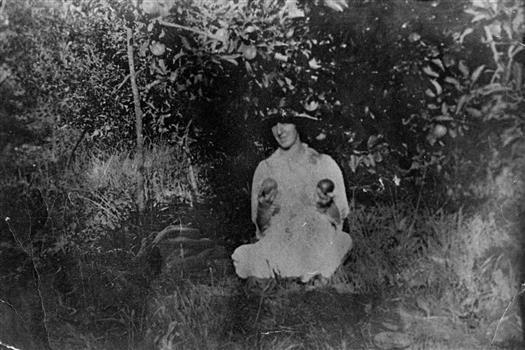 The area of Greensborough along the Plenty River was known for its orchards, which might explain why Mrs Greenwood is photographed holding the apples.